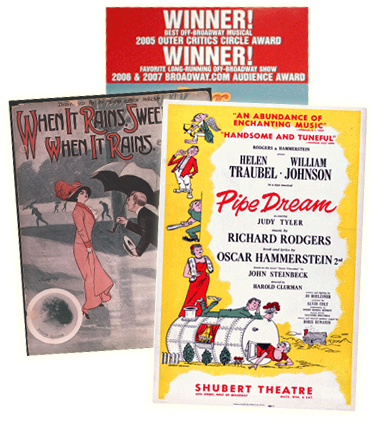 R&H Theatricals has been licensing musicals to the Arts Club Theatre in Vancouver, British Columbia for many years. R&H licenses many large- and medium-scale tours all across the globe, but was interested to learn about the Arts Club Theatre’s small-scale tours of Vancouver. We asked Artistic Managing Director Bill Millerd to talk to us about this area of his business. R&H: How many years has Arts Club Theatre been in operation? Bill Millerd: The Arts Club of Vancouver was founded in 1958 as a private club for artists, musicians, and actors, and officially became the Arts Club Theatre in 1964 when the company opened its first stage, a converted gospel hall in downtown Vancouver. R&H: You've been licensing musicals from R&H for some time. Do you find that musicals draw a wider audience than non-musical plays? BM: Musicals generally draw larger and more diverse audiences than non-musicals, particularly in a culturally diverse community like Metro Vancouver. R&H: When did Arts Club begin its touring operation? BM: The Arts Club's first tour was a national tour of the musical CRUEL TEARS in 1978. It featured Hollywood actor Bruce Greenwood. R&H: You first did I LOVE YOU, YOU'RE PERFECT, NOW CHANGE on tour in 2003. Was it one of your more successful tours? BM: We first ran I LOVE YOU… on our Granville Island Stage throughout the summer of 2003, before taking it on tour across the province of British Columbia. It was a huge hit with audiences. We tour to 7 venues across Metro Vancouver, which each sell a 3-show subscription season. We find that the years we start the season with a musical, the subscriber numbers are higher. R&H: What was I LOVE YOU, YOU’RE PERFECT’s big appeal to audiences? BM: A number of things. We had a terrific young cast and musicians on the tour. But the themes are timeless. Everyone can relate to relationships - whether they're going wrong or going right. The stories are engaging and ultimately uplifting. R&H: How long do you run your tours typically? BM: Between 4 and 7 weeks. R&H: And tell us about your tour of ALTAR BOYZ. BM: We took ALTAR BOYZ on tour earlier this year - and it was incredibly well received. The audiences loved it. We got letters and emails from audiences thanking us for the fun time they had. That was rewarding. We begin rehearsals shortly for ALTAR BOYZ for the summer run at our theatre on Granville Island. R&H: You directed ALTAR BOYZ. Share some of your thoughts about the piece. BM: The first thing I did was attend a Back Street Boys concert for research! 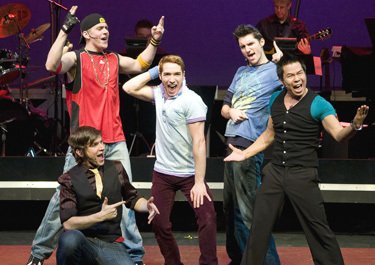 We had a tough time finding the five 'perfect' boys for the cast as they have to be multi-talented. Canada has a lot of musical theatre talent and of the five in the cast, 3 are from Vancouver, 1 came from Toronto and one from Edmonton. The show is fast paced and the 'boys' do an incredible work-out in performing it. I was greatly aided by our choreographer Sara Jeanne Hosie and our Musical Director Sasha Niechoda. R&H: Did ALTAR BOYZ attract a new ticket buyer? A younger audience, perhaps? BM: Yes, we definitely saw a younger audience come out for ALTAR BOYZ. But, people of all ages enjoyed it. Especially the girls who would hang around after the show to get autographs and take pictures! Families loved it because it was entertaining, and something they could enjoy together. R&H: You're following your ALTAR BOYZ tour with an upcoming tour of THE THING ABOUT MEN by Joe DiPietro and Jimmy Roberts who wrote I LOVE YOU, YOU'RE PERFECT, NOW CHANGE. What made you choose this title? BM: I saw this show earlier this year when a colleague of mine directed it. I was intrigued by the title, and also keen to see another work by the I LOVE YOU . . . team. It's the perfect size for touring in terms of the set and the cast and musicians. And we know that the title will appeal to our demographic. R&H: What is the word of mouth among your presenters about this title? BM: Presenters have expressed to us that THE THING ABOUT MEN has all the qualities their patrons enjoy - music, a story, and comedy. It is a very contemporary musical, with modern themes and sensibilities. We anticipate that people will leave the theatre thinking about how relationships need our time and attention to thrive at the same time as enjoying the sometimes absurd situations. And you can tap your toes to the music!